Oops - we don't appear to have a video for the Documate 150. 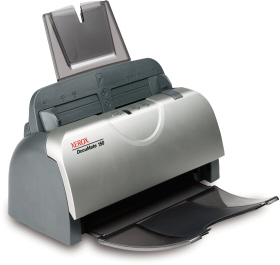 The Xerox DocuMate 150, color sheetfed document scanner, scans up to 18 pages per minute (ppm), includes a 50-page automatic document feeder and has the ability to automatically scan documents into searchable PDF files. The Xerox DocuMate 150 was designed specifically for desktop use and incorporates Visioneer OneTouch technology for eliminating multiple steps in sending scanned documents to predetermined applications or devices. The scanner offers a professional software bundle that includes Nuance PaperPort and OmniPage Pro. It also ships with an advanced TWAIN driver to enable communication with advanced electronic content management (ECM) software applications. Do you want to do more with the paper on your desk? Would you like to copy it, collate it, file it, search it, mail it and make it disappear? Sounds time consuming doesn't it? How about if you could do all that with just one touch?